Review of Mathematics of the transcendental by Alain Badiou (Bloomsbury Academic, London, 2017), Mathematical Reviews (AMS), published October 3, 2018 (pdf). Rules versus Axioms: a Constructive View of Theories, J.-Y. Beziau, A. Buchsbaum, Ch. Rey (Eds. ), Handbook of 6th World Congress and School on Universal Logic (June 16-26, 2018, Vichy, France), Université Clermont Auvergne, 2018, ISBN: 978-2-9544948, p. 541-542 (pdf_tex)(scan). Abstract: Lawvere’s axiomatization of topos theory and Voevodsky’s axiomatization of heigher homotopy theory exemplify a new way of axiomatic theory building, which goes beyond the classical Hibert-style Axiomatic Method. The new notion of Axiomatic Method that emerges in Categorical logic opens new possibilities for using this method in physics and other natural sciences. ПРОСТРАНСТВО ВОЗМОЖНОСТЕЙ, ЕГО ТОПОЛОГИЯ И ЕГО ВНУТРЕННИЙ ЯЗЫК. РАЦИО Издательство: Балтийский федеральный университет им. Иммануила Канта (Калининград) ISSN: 2312-0428. – 2013. – №10. – С. 59 (pdf) (выпуск журнала) См. также в разделе my talks. The popular view according to which Category theory provides a support for Mathematical Structuralism is erroneous. Category-theoretic foundations of mathematics require a different philosophy of mathematics. While structural mathematics studies “invariant forms” (Awodey) categorical mathematics studies covariant transformations which, generally, don’t have any invariants. In this paper I develop a non-structuralist interpretation of categorical mathematics and show its consequences for history of mathematics and mathematics education. The persisting gap between the formal and the informal mathematics is due to an inadequate notion of mathematical theory behind the current formalization techniques. I mean the (informal) notion of axiomatic theory according to which a mathematical theory consists of a set of axioms and further theorems deduced from these axioms according to certain rules of logical inference. Thus the usual notion of axiomatic method is inadequate and needs a replacement. When the traditional distinction between a mathematical concept and a mathematical intuition is tested against examples taken from the real history of mathematics one can observe the following interesting phenomena. First, there are multiple examples where concepts and intuitions don’t well fit together; some of these examples can be described as “poorly conceptualised intuitions” while some other can be described as “poorly intuited concepts”. Second, the historical development of mathematics involves two kinds of corresponding processes: poorly conceptualised intuitions are further conceptualised while poorly intuited concepts are further intuited. In this paper I study this latter process in mathematics of 20th century and, more specifically, show the roles of Set theory and Category theory in this process. I use this material for defending the following claims: (1) mathematical intuitions are a subject to historical development just like mathematical concepts; (2) mathematical intuitions continue to play its traditional role in today’s mathematics and will plausibly do so in the foreseeable future. This second claim implies that the popular view according to which modern mathematical concepts unlike their more traditional predecessors cannot be directly intuited is not justified. This is the first part of a book in progress, which contains Introduction, explaining the whole project, and a chapter on Euclid’s “Elements”. 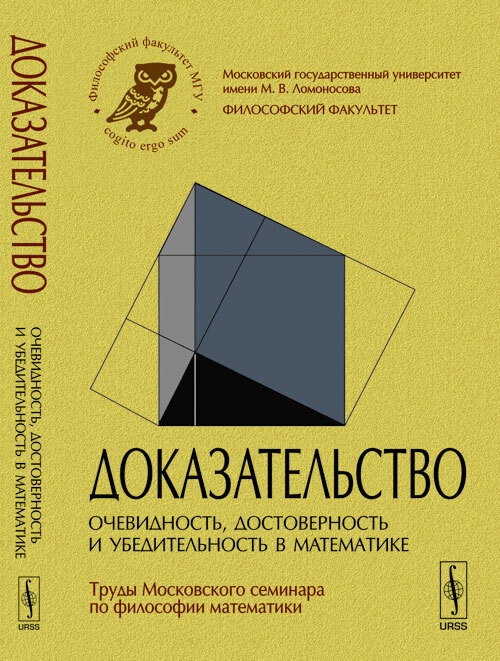 The idea of the book is to describe foundations in mathematics in their history from Euclid until today (making a reasonable choice of material) and then provide a project of future foundations of mathematics. Further historical parts of the book will contain chapters on “New Elements of Geometry” by Arnauld (first published in 1667), Hilbert’s “Grundlagen der Geometrie” first published in 1899 and Bourbaki’s “Elements of Mathematics”. The part of the book describing prospective future foundations of mathematics will be on Category theory. Теория категорий и поиски новых математических оснований физики: статья опубликованная в журнале “Вопросы философии” номер 7 за 2010 год, стр.67-82 (pdf); доступна также на сайте журнала. Identity and Categorification: paper published in Philosophia Scientiae, 11 (2), 2007, pp. 27-65 (pdf); a longer version of this paper is also on arXiv. Abstract: In the paper I check approaches to identity in mathematics by Plato, Frege, and Geach against Category theory. Towards Categorical Theory-Building: Beyond the Formal: paper (pdf); also on arXiv. Abstract: I propose a notion of theory motivated by Category theory. Математика Евклида в свете философии Платона и Аристотеля, “Наука” 2003. Монография основанная на кандидатской диссертации 1995-го года. (pdf). Также на ifolder и depositfiles.